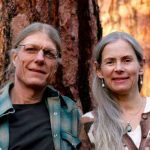 We are James and Kari, the husband-and-wife team behind Naturespirit Herbs. James grew up in Michigan and Kari is a native of Norway. Our daughter Inka and our son Arek were born at our home in the Siskiyou Mountains of southwestern Oregon. We live on 11 acres of beautiful forest and farmland. Perhaps the best way to describe us would be to say that we are back-to-the-land kind of people. We like to be active and to be outdoors. Gardening, hiking, camping, kayaking, fishing, and gathering wild foods and herbs are some of our favorite things to do. Naturespirit Herbs was inspired by our passion for wild places, seaweeds, herbs and health. We didn’t have a business plan (or any kind of plan, for that matter). 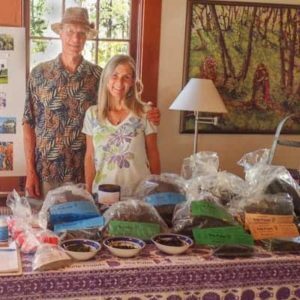 When we moved to Oregon in 1989, we harvested and dried some seaweeds and brought them to a local barter fair. We quickly sold out, harvested more the following year and sold out again! Naturespirit Herbs was born. Our business has grown steadily since the days of the barter fair. We now employ several people from our local community and produce a complete line of wild sea vegetables, seaweed powders, seaweed capsules, wildcrafted herbs and herbal extracts. We are known for the high quality of our products. We are also herbal and nutritional health care practitioners that understand the therapeutic uses of our seaweeds and herbs. Over the years, we’ve learned a lot about the health challenges that many of you, our customers, are dealing with. Our goal is to provide you with the information you need to use our products to help yourself. Although our business has grown, we have stayed close to our roots. We still harvest almost everything ourselves, in a respectful, ecologically sound way. We are still in awe at the healing gifts of the seaweeds and herbs, and grateful to be able to share them with you. When you buy seaweeds and herbs from us, you are as close to the source as you can get without harvesting them yourself. You know who harvested them, where they were harvested, and how they were harvested. The Naturespirit family circa 1998.